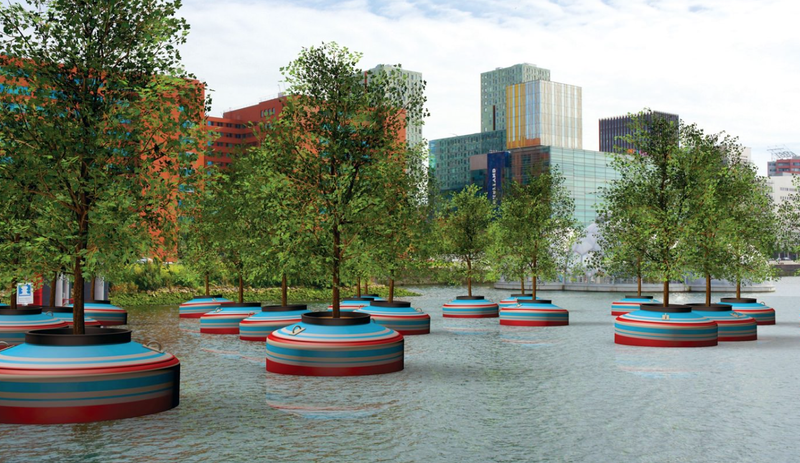 Like oversized fishing bobbers used as flower vases, these 20 trees planted in colorful buoys are designed to add whimsy and nature to Rotterdam’s industrial waterfront. The installation, named Dobberend Bos, or “bobbing forest” in Dutch, will be released into the city’s harbor in March. The idea was prompted by the work of sculptor Jorge Bakker but was brought to life by a committee of artists and designers who proposed the installation for Rotterdam’s Rijnhaven harbor, as part of a series of floating art projects to revitalize the neighborhoods around the docks. Although a floating forest makes plenty of sense in a country like The Netherlands where water is often more readily available than land, this also provides some inspiration for coastal cities that are struggling to add greenspace but can’t plan more than a few decades down the line due to the possible detrimental effects of climate change. I’m thinking about the specific challenges in places like Miami or New Orleans, for example, which are already wrestling with rising sea levels—it would be awful to build a new waterfront park, for example, only to have it flood constantly or be submerged completely within a few years. A floating forest, or even an entire floating park, accessible by bridges (or boats if necessary), would add a splash of green and help to demarcate a public space—whatever the future might bring.